E-Z Construction proudly supports Hand in Hand Ministries, which seeks to build strong communities through cultural immersion, education, housing and healthcare outreach. To learn more about Hand in Hand Ministries and immersion trips, visit their website. Being active in our community also means taking care of the environment. Eco-Aware: We strive to build with care for the earth and the environment of our community in mind. We do this because we believe that business and industry do not have to compete with the environment. Our projects can improve their surroundings, become positive additions to the landscape and foster a sense of pride for ourselves and our clients. 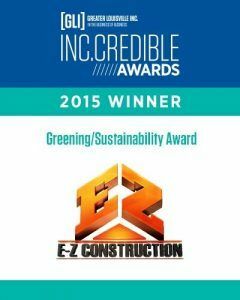 E-Z Construction was recently selected as the winner of GLI’s Inc.credible Green/Sustainability Award. This award is a reflection of our effort to work with local agencies and businesses to provide construction services in the green infrastructure and green engineering practices. This year we have again partnered with GLI as a Top Investor.